If you’ve lived in Norwich, and especially in the Beaver Meadow area, you probably know Arthur. And if you know Arthur, you probably have had occasion where Arthur came to your rescue in an emergency. Known by some as the ‘gatekeeper of the Meadow’ as his house is situated at the corner of Beaver Meadow and Chapel Hill road, Arthur has been there when cars slid off the road during icy storms, repaired the bell on Beaver Meadow Chapel when it’s been rung too exuberantly by young churchgoers, or plowed out the schoolhouse or chapel when they were needed for an event or service. The Arthur we are talking about is, of course, Arthur Owen, a longtime member of the Upper Valley community who has had occasion to touch many of our lives with his substantial skills in problem solving and improvising to get us out of jam or ditch, get that well working again, or shore up that foundation. Arthur’s ability to save the day is legendary even to young children who have told their parents to call Arthur when a problem has them stumped because “Arthur can fix and build anything.” Arthur’s innate abilities and the skills he had acquired in his years of working for Dartmouth Buildings and Ground Department made him a go-to resource to resolve much of what comes with living in tough New England. Even if you don’t call Arthur for help in an emergency, he has a way of showing up at just the right time, analyzing the problem, and showing you what needs to be done. It was with these moments in mind that friends and family of Arthur decided to hold a party to show appreciation for those many instances when he has touched our lives. 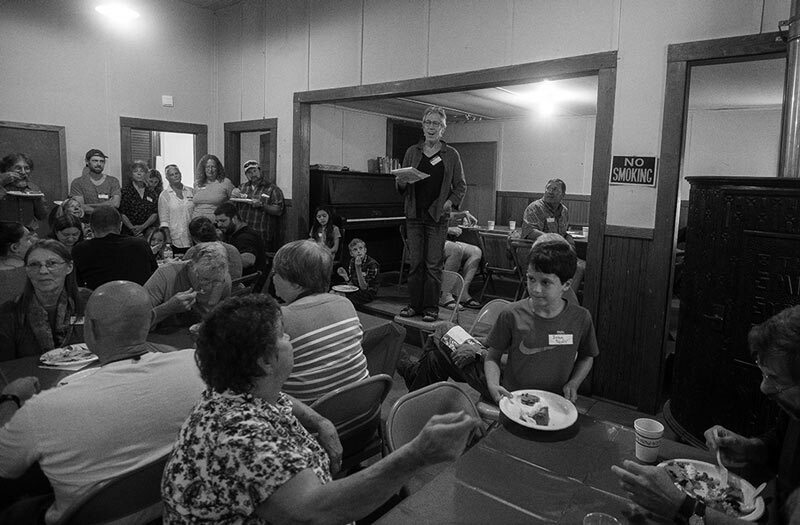 Close to a hundred people gathered at the Beaver Meadow Schoolhouse in late August for a potluck dinner after a sing-along at the Beaver Meadow Chapel. With the schoolhouse filled to capacity, several people recounted stories of the times Arthur helped them in a moment of need. Some were funny and some ended with hardly a dry eye in the house, but all seemed to end with the mention of “pie.” It appears that the one payment Arthur appreciates for his many services is a good pie. The last couple of years have brought some changes for Arthur. After his first wife, Shirley, also a legend of the Meadow passed, Arthur married again. He has since moved from Beaver Meadow and is now building a house in Newbury, Vermont, a decision he made so his wife, Carol, could be closer to her job. But he still holds on to his house here in Norwich, and is often seen in the dooryard working on his trucks or plowing through the last year. And now, Arthur has also had to fight against esophageal cancer, a disease that doesn’t yet know Arthur’s resourcefulness in overcoming obstacles. Upon receiving the news of the cancer, the Owens contacted the Beaver Meadow community for prayers and positive thoughts, and those seem to be working well. Arthur’s cancer has not metastasized. It has responded well to chemo and radiation, and the doctors are optimistic that with surgery, scheduled for September, he will be able to beat it. 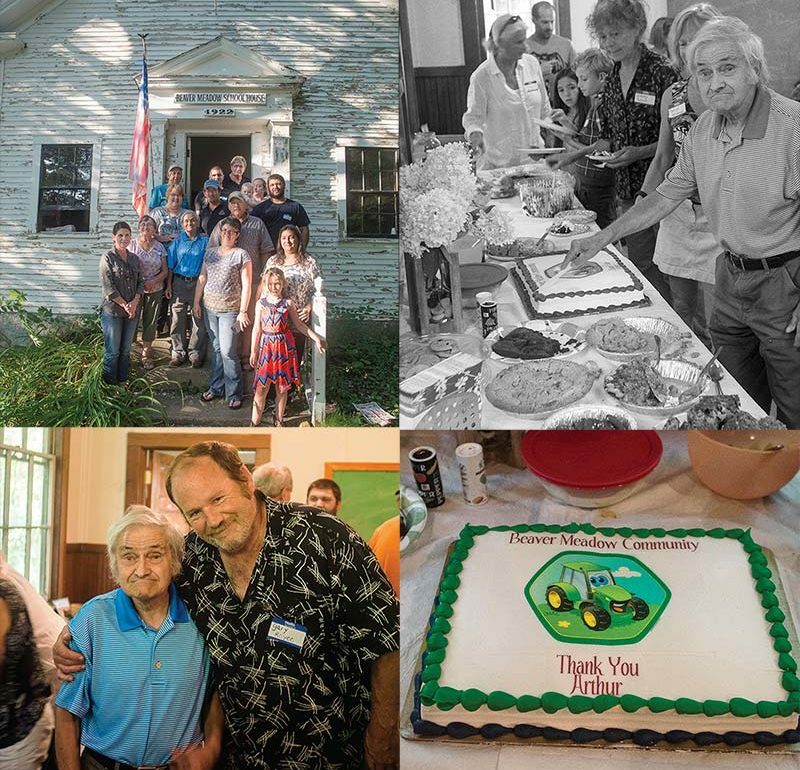 The party at the schoolhouse was evidence of the support that Arthur has from the community, and assurance that neither distance nor the trials of illness put much of a dent in Arthur’s impact on Norwich, and for that we are grateful.